Speaker Neng Thoa, center, joins conference organizers Mai Xiong, left, and Ro Encizo, right, for a picture in Madison College’s Intercultural Exchange. 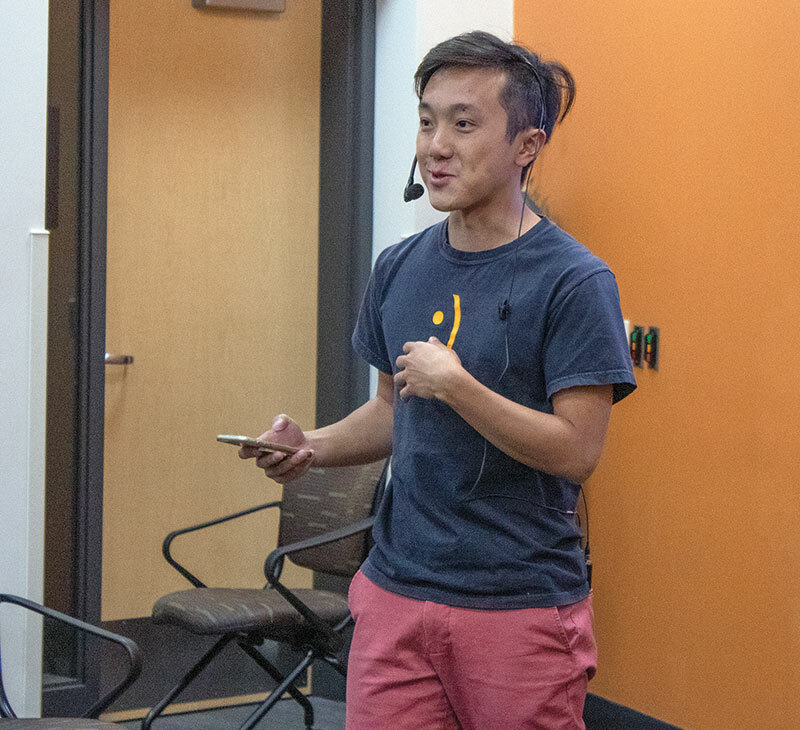 Donning faded salmon-colored pants, a headset mic, and grey shirt with a sideways yellow/orange smiley face in the middle, Neng Thoa took the stage at the front of the room to start the second half of the “Changing the Narrative” conference. His message was clear and simple: we can build something fruitful, in real life, by connecting with individuals. 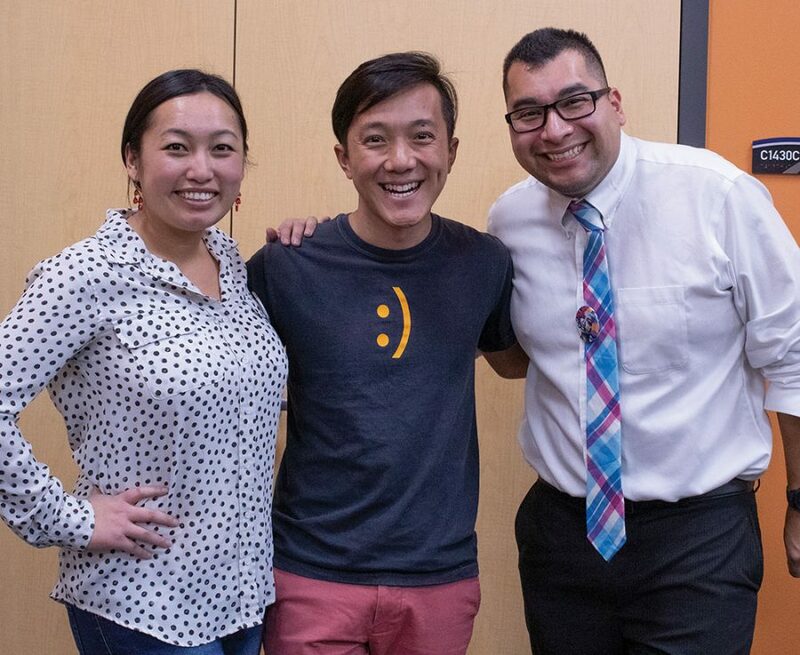 Born in a refugee camp, and being raised in a modest, low-to-middle class household, Thoa knew that he wanted to be traveling the world and making those connections with other human beings. While he was in Indonesia, where the population speaks more than 300 different languages, Thoa realized that smiling, similar to the smile mirrored on his shirts, is a universal language that everyone understands. These small realizations have helped Thoa incubate his relations and connections. “But we pull those strings to make a connection to create that opportunity, but you have to work at (nurturing) them every single day,” he said. Thoa touched on many subjects during his time on the stage, but seemed to emphasize two concepts passionately: people shouldn’t be “living the dream” they need to be “working the dream,” and the legacy of living a happy life that positively impacts people around you. “The world is big enough for what you want to do. Make sure it is something great and measure how it impacts other people,” Thoa reminded the crowd gathered in the Intercultural Exchange. Was it spent working overtime at the office, or nourishing relationships and deep connections with friends and family? Neng Thoa speaks at Madison College’s annual Changing the Narrative Conference on Nov. 16.